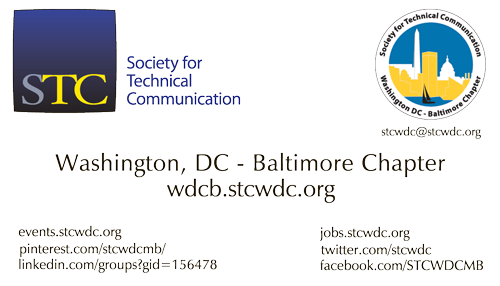 The following are STC and Washington, DC – Baltimore (WDCB) Chapter logos and symbols for use in websites and chapter stationary. See also, the printable files for the Chapter Stationary. Q. Can STC members use the STC logo or logotype on personal documents or websites to promote themselves or their professional services? A. Yes if you follow the Guidelines for Using the Society Symbol and Logotype, Revised October 2009. STC members in good standing may use a specialized rendition of the STC logo on stationery, business cards, and websites to indicate their membership in the Society. 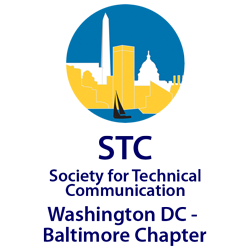 Member logos are available for Members, Senior Members, Associate Fellows, and Fellows. See "What You Need to Know to Use the STC Specialized Logo-Member Version" (.pdf) for information about how to use the specialized logos. Q. 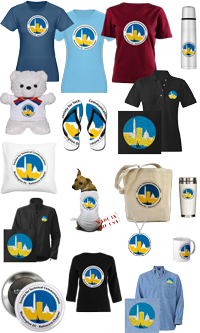 Can STC members use the STC logo or logotype to promote products or services? A. No, you cannot. 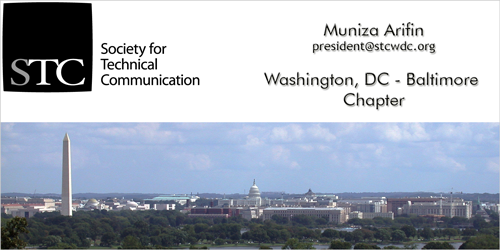 The STC logo is the uniquely formatted "STC" symbol and the logotype is the uniquely formatted text "Society for Technical Communication." Both of these appear on officially sanctioned STC publications or documents. Our logo and logotype should not appear in advertisements, literature, or other communications that promote, or include the promotion of, products or services of others without the written approval of STC's Executive Director, as this implies endorsement by STC. Do not incorporate or blend the STC logo into a corporate logo, company name, product name, lettering, or in any way become part of any surrounding shape or design without the written approval of STC's Executive Director. Q. 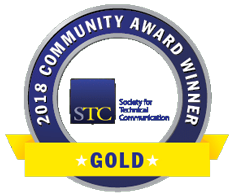 Can STC competition winners use the STC logo or logotype in resumes or company publications, on websites, or on reproductions of the winning piece? A. Yes, you may use special award ribbons; not the STC logo itself. Winners of the international level competition may use the STC international award ribbons in resumes or company publications, on websites, or on reproductions of the winning piece. The international ribbons can not be used for chapter-level award winners. Chapters create their own emblems with similar design elements but they cannot incorporate the STC logo. Download the images for the STC International Summit Awards Competition Ribbons (for best of show and winner ribbons). Winners of our WDCB Technical Communication Competition awards may freely duplicate our chapter award ribbons in resumes or company publications, and on websites or copies of the winning piece. The chapter's award badges may be downloaded from the STC WDCB Competition Award Badges page. Winners of STC chapter achievement awards may download the images from the STC Community Achievement Award Ribbons page. Logos with and without drop shadow are included for all designs.